Fueling: Private on-site infrastructure, with future plans for publicly accessible stations. To find an economical replacement to diesel and serve as an environmental leader among mass transportation agencies. $2.49 per gallon fuel cost savings. $70,000 per vehicle in lifecycle fuel cost savings. 20,400 fewer pounds of carbon dioxide emitted annually per vehicle. Each year, Flint Mass Transportation Authority (MTA) transports nearly 470,000 passengers through its paratransit service. Seniors, persons with disabilities and the general public rely on the MTA’s “Your Ride” curb-to-curb shuttle bus service within the City of Flint and Genesee County. As the fleet of shuttles aged, the MTA took the opportunity to explore alternative fuels. Flint MTA’s decision to explore alternative fueled vehicles maintained an underlying mission: Provide sustainability for the future, both economically and environmentally. During its extensive research, the agency examined many factors, including refueling needs; vehicle availability and warranty; rider requirements; and the fuel itself. The MTA also considered that fuel systems designed by companies with Ford Qualified Vehicle Modifier (QVM) status would retain the original factory Ford warranty, an important factor for the agency. In 2010, Flint MTA received a Federal Transit Administration (FTA) grant through the “State of Good Repair Program” to purchase natural gas buses. This program funds the maintenance and upgrading of vehicles to ensure that the nation’s public transit “operates safely, efficiently, reliably and sustainably.” It provides 80 percent funding with a required 20 percent match. But the MTA learned that upgrading its fueling stations to include natural gas would cost in excess of $1 million per station. In contrast, the MTA could install 10 propane autogas stations for the price of just one natural gas station. The agency requested and received a grant amendment to allow for propane autogas vehicles instead of natural gas buses. 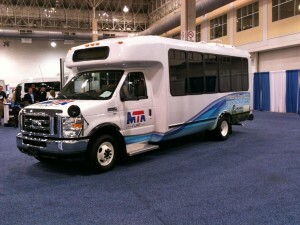 Flint MTA selected the Ford E-450 cutaway equipped with the ROUSH CleanTech propane autogas fuel system. The versatility of the vehicle platform allowed the agency to enhance its bus features, including more passenger and wheelchair capacity. The 41-gallon fuel tanks provided the range required. As a Tier 1 supplier and Ford QVM manufacturer, ROUSH CleanTech’s vehicles retain both the original factory Ford warranty and the same quality Ford performance characteristics, such as horsepower, torque and towing. And the Environmental Protection Agency and the California Air Resources Board certify the shuttles. MTA also considered the vehicle’s “Altoona-testing,” named for the primary test facility location. This FTA New Model Bus Testing Program rates new transit bus models on safety, structural integrity and durability, reliability, performance, maintainability, noise and fuel economy. Purchasing alternative fuel vehicles tested through Altoona allows eligibility for FTA funding. These federal funds cover 85 percent of the entire alternative fuel vehicle cost, with a 15 percent local match. “Altoona-tested vehicles provide huge financial assistance for any paratransit fleet looking to operate on alternative fuels,” said Edgar H. Benning, general manager of Flint MTA. The agency received its first vehicles in 2011 and currently operates 37 propane autogas buses, with 35 more planned for delivery by early summer 2013. Once all 72 shuttles are in operation, the agency will hold the distinct honor of operating the nation’s largest propane autogas fleet in the public transit industry. 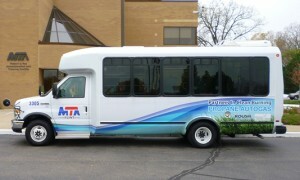 Fueling with domestically produced propane autogas offers Flint MTA a cleaner emissions profile. By operating on propane autogas, the MTA eliminates more than 200,000 pounds of carbon dioxide during the lifetime of each vehicle. Compared with gasoline-fueled vehicles, propane autogas vehicles emit about 20 percent less nitrogen oxide, 60 percent less carbon monoxide, and up to 24 percent less greenhouse gases. Compared to diesel, propane autogas releases virtually no harmful particulate matter. Along with its environmental benefits, domestically produced propane autogas is economical. Historically, propane autogas costs up to 40 percent less than gasoline and about 50 percent less than diesel. Flint MTA has experienced even greater savings, paying $1.21 per gallon for propane autogas compared to $3.20 for gasoline. Current federal tax credits provide an additional $.50 per gallon savings, bringing their propane autogas cost to $.71 per gallon. Flint MTA expects to save $70,000 per vehicle during their normal lifecycle of 10 years and 350,000 miles, for a total savings of more than $5 million — before fuel tax credits. So far the agency has driven about 500,000 miles in its propane autogas vehicles. A recent MTA analysis during a one-month period of time showed the agency paid $.12 per mile for propane autogas compared to $.39 per mile for gasoline and $.41 per mile for diesel. In addition to fuel savings, the agency experiences lower maintenance costs by fueling with propane autogas. Their propane autogas vehicles require just six quarts of oil compared to 16 quarts for their diesel vehicles, with oil changes needed every 7,000 miles compared to 4,000 for their diesel shuttles. Plus, the filter packages for propane autogas are priced two-thirds less than the diesel filters. A team of MTA employees received initial training with the fuel and now operates a maintenance facility for servicing the propane autogas vehicles and training new hires. At the pump, Flint MTA saves time, too. At eight gallons per minute, MTA drivers find refueling time quicker when compared to their conventionally fueled shuttle buses, which refuel at about five gallons per minute. For refueling convenience, the agency installed two propane autogas stations. And last year, Flint MTA broke ground to install an alternative fuel facility in Grand Blanc Township. The first of its kind in Michigan and one of only two in the country, the station offers hydrogen and compressed natural gas in addition to propane autogas. These successes have led Flint MTA to plan for more alternative fuel growth, with a goal of 60 percent reduction in diesel usage by 2018. By the end of 2013, the MTA will operate five propane autogas fueling stations and purchase 20 more minibuses for a total of 92 propane autogas vehicles. Their next phase will include opening a publicly accessible alternative fuel station and building a community alternative fuel training facility. Future plans also incorporate static fuel cell units to heat and electrify the agency’s storage facilities. About Flint Mass Transit Authority: The Flint Mass Transportation Authority is the agency authorized to provide public transportation services in Flint and Genesee County in Michigan. The MTA’s services include primary fixed routes, peak routes (running only during designated times) curb to curb service (known as “Your Ride”), specialized services for the elderly and persons with disabilities, and maintenance of the Flint Transportation Center, Community Services Centers, Greyhound and Amtrak Rail Station in Flint.